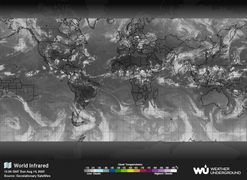 The United States satellite images displayed are infrared (IR) images. Warmest (lowest) clouds are shown in white; coldest (highest) clouds are displayed in shades of yellow, red, and purple. 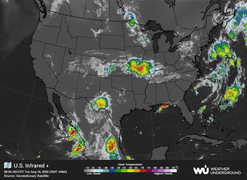 Imagery is obtained from the GOES and METEOSAT geostationary satellites, and the two US Polar Orbiter (POES) satellites. POES satellites orbit the earth 14 times each day at an altitude of approximately 520 miles (870 km). As each orbit is made the satellite can view a 1,600 mile (2,700 km) wide area of the earth. Due to the rotation of the earth the satellite is able to view every spot on earth twice each day. Data from multiple orbits are mosaicked together to provide wide scale global and full earth views in a single image. Occasional dark triangular areas that occur on POES images are a result of gaps in data transmitted from the orbiters. 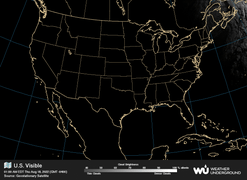 This is the map for US Satellite. Other environmental satellites can detect changes in the Earth's vegetation, sea state, ocean color, and ice fields. For example, the 2002 oil spill off the northwest coast of Spain was watched carefully by the European ENVISAT, which, though not a weather satellite, flies an instrument (ASAR) which can see changes in the sea surface. 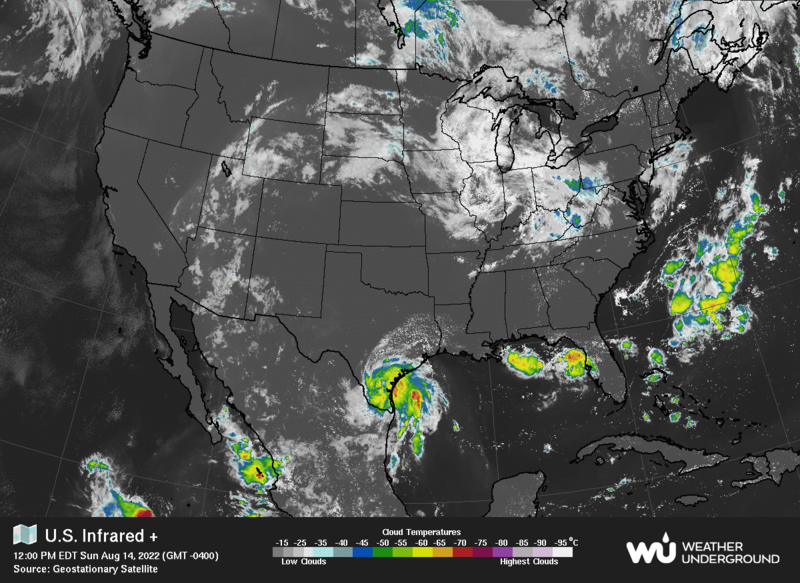 El Niño and its effects on weather are monitored daily from satellite images. The Antarctic ozone hole is mapped from weather satellite data. 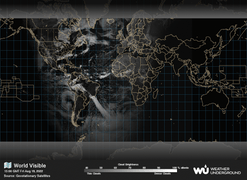 Collectively, weather satellites flown by the U.S., Europe, India, China, Russia, and Japan provide nearly continuous observations for a global weather watch.